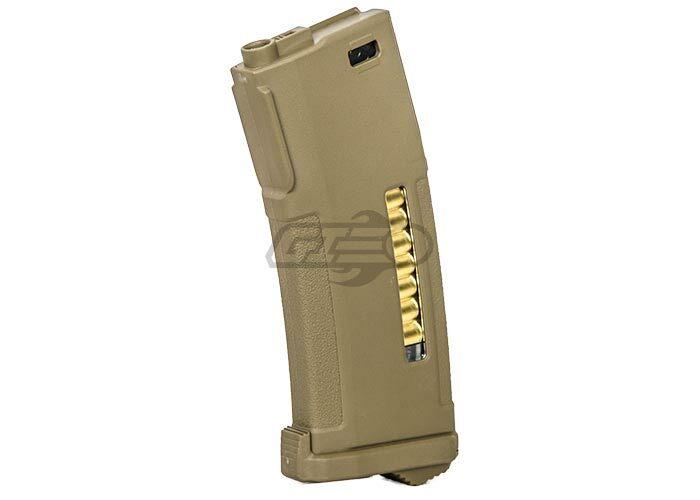 This mid capacity AEG magazine holds 150 rounds with the same reliability that has made PTS magazines famous. It is compatible with Version 2 based M4 AEGs by TM, KWA, PTS PDR-C, PTS ERG series, PTS Masada, G&P, the VFC 416, and the CA 416. This is by far the best mid cap magazine I have ever used. When you put it in your gun there is a distinctive click and it doesn't move. I mean it is rock solid, no wobble at all. As described, when the mag is topped off the orange trailer comes into view in the small window beneath the fake bullets. The mag has great contours, when I grab this mag it feels very easy for me to swap it out for another mag. As for the performance, it feeds flawlessly in my M4, which has a 6.03 mm tightbore inner barrel and a lonex A2 infinite torque up motor. I'm guessing it shoots between 18 and 21 bbs a second. Really there is no downside to this mag, PTS has really stepped it up with this mag. -Great contours, it feels natural when holding it, I can't explain it any other way. -No wobble while in my gun, unlike most mags. -Orange trailer indicates when you're topped off. -Nothing, and trust me, it's a whole new company since it moved away from magpul. I bought a hi cap pmag while they were under magpul and it was horrible, so I had doubts about this mag. Needless to say, I absolutely love this thing, easily the best mid cap on the market right now. All tests and functionality examples were performed with a Krytac CRB, averaging 23 rps. A little loose in my Krytac, but that's not necessarily the result of a misshapen magazine. I bought 1 yesterday at Tx walkin store for my VFC M4 Sopmod block 2 and it's perfecto. Will recommend these for anyone running a vfc or echo1, CA, G&P or G&G. M4 or M16 havent tested in any bull pump modles. none at least to my knowledge yet I've only had it 1 day but will be buying plenty more to use because you can add ranger plates. Fit in a Classic Army SCAR-L? Does this come in High Cap? Will this not break my KWA SR7 or the mag itself? I did not upgrade the gun internally or externally and I'm not planning to. Will these work? Please help! This is just a magazine, it does not influence the internals of the gun. Do these fit an EF 416 CQB? A lot of mags do not fit the 416. If these don't please advise a reliable mag. Thank You! These magazines will work. Other players have been using it already. would these fit in a scar? Yes, this should fit most M4/M16 magazine compatible platforms. Yes! This magazine should fit and function with the KWA series of M4 AEGs. Next year will you possibly still have these in stock again? Would these fit and feed in a D Boys 416?